Basketball fans at the University will be hearing the name Bibeau a lot over the next few months. That’s because there are not one but two Bibeaus starting, and likely starring, for McGill this year – one a Martlet, the other a Redmen. Education major Hélène Bibeau returns to the Martlets team on which she ranked fifth in scoring average as a rookie last year. Her brother Simon, meanwhile, is a highly touted freshman who was the rookie-of-the year and a first team all-star in Quebec’s CEGEP AAA league last season as a member of the Champlain-St. Lambert Cavaliers. The B-ball Bibeaus, natives of St. Bruno, Que., inherited both their height and love of the game from their father, François, a former Université Laval player who introduced his children to basketball at a young age. Both six-foot tall Hélène, now 21, and six-foot-two Simon, aged 19, have been excelling at the game since elementary school, each starring on school teams and regularly playing on Quebec provincial squads over the years. And each earned admittance to an elite-level development academy while still in their early teens. Hélène left home at age 14 to go to the provincial basketball development centre (CPEQ) in Lévis, Que., while Simon attended the National Elite Development Academy (NEDA), which brought together the top high school aged boys and girls in the country to train and go to school in Hamilton, Ont. The Redmen’s newest guard even represented Canada as part of the Junior national team that competed at the FIBA America Qualifiers Championship in Argentina in 2008. 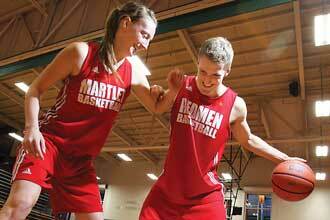 Hélène came to McGill after starring for CEGEP basketball powerhouse College Montmorency for three years. Like some of her teammates there, she contemplated heading south to a U.S. school to play basketball. Her brother Simon followed a less conventional route to McGill. Originally hoping to head to an NCAA school to continue his career, he found himself having to come back home and attend CEGEP for a year after funding cuts shut the NEDA program down in 2009. A Quebecer who completed high school in Ontario, he’s a now a U0 Management student. Although he was seriously scouted by some U.S. schools last year while playing at Champlain, Simon found no takers at the ones he was interested in. “Right now I’m just trying to focus on excelling in the classroom and on the court. Who knows, maybe it will lead me to the national team or even a professional career one day,” he said. “But it’s not my ultimate goal. Right now my degree here is what counts. After establishing himself as one of the team’s standouts during the pre-season, Simon led the Redmen with 18 points in their regular season opener, an 82-65 victory over the Bishop’s Gaiters last Saturday. Hélène, meanwhile, chipped in with 12 points of her own when the Martlets cruised to an easy 70-47 win in their debut, also over Bishop’s. Indeed, both Bibeaus are prolific shooters. The scouting report on him posted on an ESPN college basketball website says Simon “is almost automatic when his feet are set, with range well beyond the college arc…,” and Hélène, a post-forward, boasted a .926 average (25 for 27) from the free throw line last year, tops among Martlets regulars. While she conceded Simon would likely get the best of her in a game of one-on-one, Hélène Bibeau thinks she could give her little brother a run for his money at a game of H.O.R.S.E., that age-old contest of basketball shooting proficiency. Simon doesn’t look too sure, but still smiles at his sister’s claim. And we’ll never know, unless the siblings fill us in after settling things on their own, perhaps in the driveway back home. But one thing is for sure: it’s hoops fans at Love Competition Hall that will be left smiling should each of the b-ball Bibeaus live up to their potential as McGill’s shooting stars.